Scots conjunctions tend to work harder than English ones, and generally cover a range of English synonyms. As a result of this and the use of prepositions to extend meaning described above, Scots texts often seem more concise and direct than their English translations. A few illustrative equivalents are given below. wioot without, devoid of, lacking. There are two words for ‘if’ in Scots, if and gin (pronounced with a hard ‘g’). 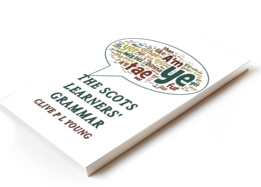 The first covers matters of fact If ye’r that smert, you dae it (if you are so smart, you do it), the other for speculation – and nowadays more a written than spoken form- Gin ye gat the job, whit wid ye dae? (if you got the job, what would you do). ‘As if’ in Scots is like as if.